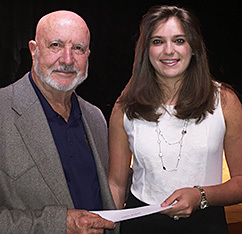 FOR Vice President and Scholarship Committee Chairman Fred Kanter presented a FOR San Bernard $1,000 scholarship to senior Amber Klepser at the May 31 awards ceremony. Read about the other 2016 scholarship winners. Amber Klepser is the last 2016 FOR San Bernard $1,000 scholarship recipient, for a total of six awarded this year. Amber graduated 3rd in her class of 199 at Sealy High School where she sat proudly on the stage with a handful of other senior Student Council members having been class treasurer for all four years. She proudly rose at least ten times receiving scholarships from many various organizations including the University of Texas President's award where she plans to spend her college years studying Electrical Engineering. She excelled in academics, sports, volunteer activities, and church during high school, but what is more amazing about this young lady is her clear vision of where she plans to go and what she plans to complete in the future. " I will create and design new products and systems that will benefit the environment ...generation of power through the use of solar, wind and water and the use of other renewable energy sources. My career will positively impact the environment by improving energy efficiency, design of electric vehicles and making advances in energy transmission, distribution, and generation." Mr. DuPont, a Sealy High School instructor, wrote "Amber demonstrates unprecedented leadership qualities both in her extracurricular activities and in the classroom. She is an exceptional student...with deep ties and commitment to her local community and shares the Friends of the Rivers' passion for preserving, protecting, and promoting the San Bernard River for future generations."